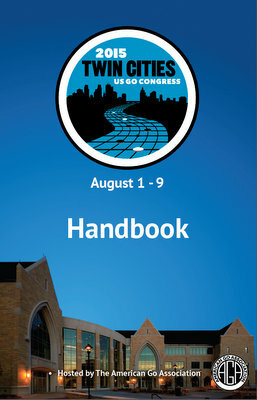 With this year’s US Go Congress just a few short days away, organizers have released the Congress Handbook so that attendees can begin planning to make the most of their time at the biggest go event of the year. The Handbook provides information about the Congress venue – including maps – and the many events that make of the Go Congress, including rated tournaments like the US Open, Die Hard, and Self-Paired, and unrated events like the Lightning Tournament, 13×13 and 9×9 tournaments. In all, ten tournaments are scheduled, along with events with professionals – including simuls and lectures – and youth activities and tournaments. Also covered in the Handbook are Day Off options, transportation, nearby restaurants and official go rules and guidelines, as well as bios and photos of all the visiting professional players.